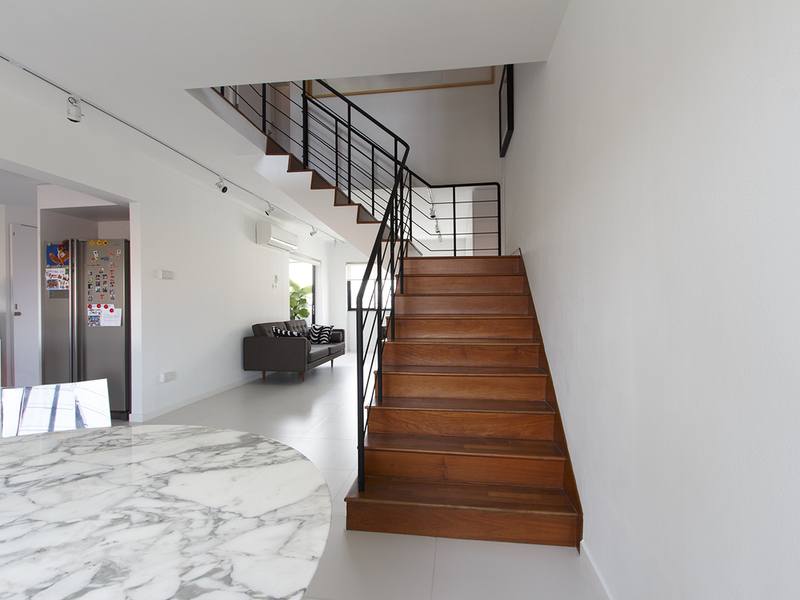 This is a revamp of a HDB maisonette unit on the highest floor that allows the opportunity for a glass roof over the entrance area. From the entrance one enters into a lounge space greeted by a kitchen island counter. The open kitchen addresses the entrance and directs one to the adjacent dining space. The linearity of the living/ dining space is accentuated by a 5-metre long cabinet in the living. The two walls at the upper floor adjacent to the staircase were replaced with sliding panels to allow flexibility, light and cross ventilation. Combination of white interior is highlighted with oak veneer niches at the cabinets. The project was completed in August 2013.